A playlist will allow you to stream multiple songs without having to go search for the song every time. 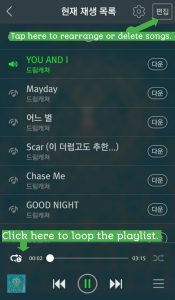 It also allows you to loop the playlist so it will restart every hour or so, so that the title track stream will be counted correctly. First, tap the magnifying glass to search for 드림캐쳐. 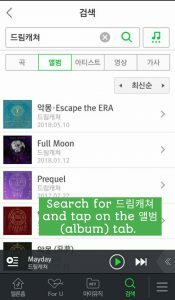 Once the results come up, tap on the 앨범 (album) tab to access the full albums. Tap on the desired album. Tap to select the songs you’d like to add to the playlist. Songs that have been selected will appear highlighted as shown below. 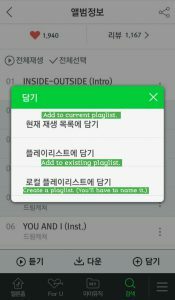 Once you have selected your desired songs, tap the (+) 듣기 button at the bottom of the screen to add them to a playlist. You will be given the following three options. 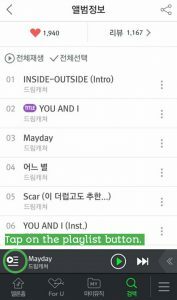 Once you’ve added the songs, you can access your playlist by tapping on the playlist button at the bottom left-hand corner. 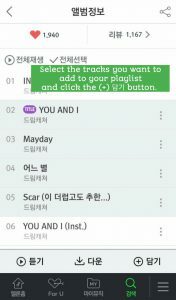 If you’d like to delete or rearrange the songs, tap on the 편집 option. Once you’re in editing mode, you can tap on a song to delete it (you will see the option at the bottom of the screen, next to a trash can icon,) or you can move it up or down using the three lines that will appear while you’re editing. While there is no set order to the songs, we recommend doing the following. • As streams are only counted once per hour, create a playlist that lasts about an hour or so. • Add all of Dreamcatcher’s songs – title tracks and B-sides. To make the playlist longer, you can also add songs multiple times. To do this, simply repeat the process above. • Although streams are only counted once per hour, streaming songs multiple times within the hour will count towards Gaon Chart and for the Melon Music Awards. Keep in mind, however, that you must alternate songs! If you play any song consecutively, it could be considered spam, so please alternate. • Tap on the loop button at the bottom as shown in the image above. This way, once all the songs have played once, it will automatically restart. • Do NOT lower the volume on the app. If you must, lower the volume on your device ONLY. Make sure the volume on the app itself is at full volume. • Do NOT put the playlist on shuffle, pause the songs or fast forward/rewind the songs. Just let it play. Try to have the playlist going whenever you can. Even if this doesn’t get Dreamcatcher into the top 100, it will give them more digital points and that’s what we want!